A scourge has taken this great kingdom, razing its grand castles to the ground. Restore the derelict strongholds, but beware of evil creatures haunting the realm. The number of moves is limited, but you can trade lives to get more moves. When a borad is completed, its borders turn green, click here to transport to a nearby game board. 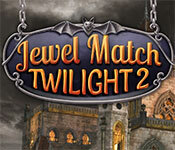 Click to start Jewel Match Twilight 2 Free Download. Sign-up to get informed when the Jewel Match Twilight 2 series has new game released with BD Studio Games' FREE bi-weekly newsletter.